The solstice is a day and a half away. Yesterday I noticed that the winter sun was not inclined to travel very far away from the southern horizon. Night comes early and lingers longer. At this latitude, we get about half as much sunlight in winter as we do in summer–eight hours now compared to sixteen in early July. It’s a good time for some sort of celebration, some ritual to bring light into the darkness. Cultures have been doing this for centuries, from pagan solstice observations to Roman Saturnalia to Hannukah, Christmas, and Kwanzaa. I feel deeply connected to my upbringing this time of year. As a person of German Lutheran descent, there are certain traditions I keep, even though I am not a practicing Christian. The Christmas tree was a pagan invention adopted by Germans, and brought to this country by immigrants. I love having a tree in the house. It takes me straight back to childhood, and magic. The tree (a Douglas-fir cut down somewhere on the back forty) was taller than I was, and festooned with decorations and tinsel. It glowed in the darkened living room, and there were presents under it. Pure magic. The tree meant that Santa Claus was coming. Excitement bubbled in my brother and sister and me like fizzy pop. These days I find myself a small tree and go through the whole ritual. I have shiny glass balls that I remember from my earliest Christmases (thanks for passing them down, Mom). They were blown and painted in Czechoslovakia and Japan. There are others that I have found over the years, all old and somewhat tarnished. I love them best. I have also collected bird and cone ornaments, for a forest theme. When I spend winter in the valley, I want to remember my summers high up in the alpine. Before bed, I light the Christmas tree and sit in the dark in my flannel jammies letting the magic of memory flow through me. Memories of family and holidays spent together. Memories of a few special gifts (Raggedy Ann sewn by mom and stuffed with her cut-up old nylon stockings, the blue bicycle, the boxed set of Dr. Doolittle books). Getting up in the pre-dawn dark with my brother to have a look at what Santa left in our stockings. The family potlucks with cousins, laughing so hard that root beer squirted out my nose. And Christmas mornings with my brother and sister’s children–the magic continues through another generation, and another. The connection is also strong when I sit with my knitting on long winter evenings. My mom and gramma both taught me to knit, but it wasn’t until I spent time with my great-gramma Elisabeth Rayton that I finally got it. I’m not sure what she did, but I remember the light bulb coming on. At family gatherings, the genders automatically separated. Men out to the barn/shop and women in the house. None of my female relatives sat with idle hands for very long. There was knitting and talking, crocheting and talking, embroidery and talking, sock darning and talking. Something about handwork helped the talking flow. Kids ran between the groups of adults. If you needed Mom’s attention you had to be prepared to hear: “Just a minute while I finish this row.” She still says that. Knitting reminds me of my beloved Gramma Mueller who was a part of my life for 52 years. She stopped knitting during the last two years of her life–her hands were so twisted and sore. I keep things she made for me out of yarn and thread and they’re like her hugs–warm and sturdy. Some of her knitting needles are in my collection. I may never be as skilled a knitter as her (or my mom or my sister), but the pleasure of rhythmic movement of my hands and yarn slipping through my fingers is surely a family trait. These winter evenings I sit knitting and admiring the Christmas tree until I can’t keep my eyes open. Winter can be a tough time, but here in my little house I have come to appreciate the stillness and dark. There is time to make things, notice magic, feel connected to all that was and all that is, and imagine what may be. Next postHear Ye, Hear Ye! Lovely post–we have a sub-alpine fir decorated that we cut off our land–nice and narrow for our small living room. I have the lights on a timer so when I wake in the morning the tree is on to brighten the still dark house. Going to a Solstice party Saturday–even thou Winter officially begins it’s also on the slide towards spring. Enjoy your posts have a great 2014! You paint such a warm, vivid scene here, almost like the light coming back again in cozy winter warmth. Happy Solstice! Does your mother also have a wordless way to say, “Don’t interrupt, I’m counting stitches.”? Thanks for sharing a bit of your rituals with us. 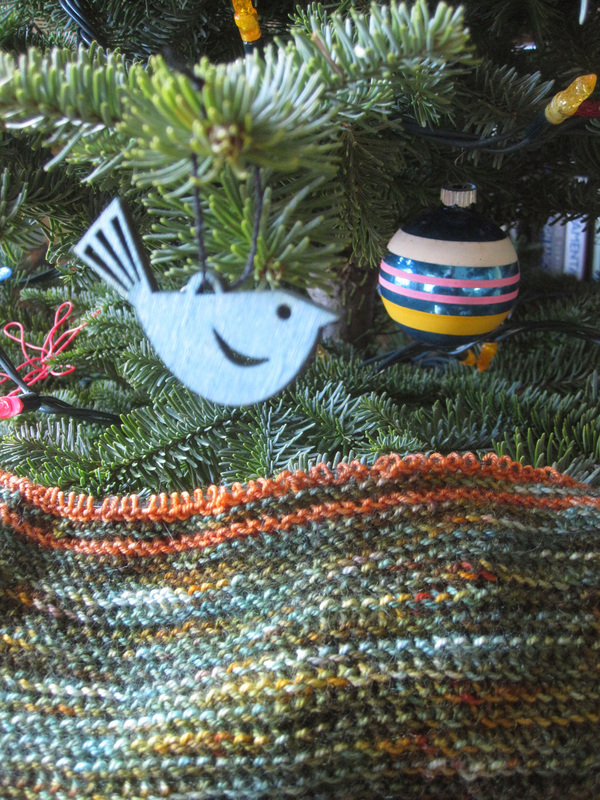 I love seeing you knitting, enjoying your tree, appreciating the stillness & darkness.